The world’s classic felt tip writing instrument lets you express yourself with true style and color. Quick-drying, water-based ink prevents smearing, and your writing won’t bleed through paper. Great for editing. Point Guard tip prevents fraying and extends the pen’s life. Click-seal cap with clip prevents dry out. Available in 26 colors with medium tip and 8 colors with ultra fine tip. Nylon point is acid-free, so writing will last a long time without damaging even fine papers. Set of 16 Pens includes 1 each of Black, Blue, Navy, Sky Blue, Olive, Green, Lime, Yellow, Marigold, Tangerine, Pink, Magenta, Red, Lilac, Purple and Plum. 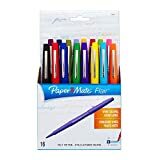 Paper Mate Flair Porous-Point Felt Tip Pen, Medium Tip, 16-Pack, Wallet, Core Colors (70644).